This is the only pic I could find online for this dish, but when I make it, it turns out much prettier, and the turmeric gives it a nice color. Heat oil over medium heat. Add sliced onions and saute until golden brown. Stir in garlic/spice mixture and pepper. Stir in half of the shrimp. Add tomato slices, and cook for 10 minutes over medium heat. Add water and salt. Increase heat and bring to a boil. Add rice, stirring to mix evenly. reduce heat and simmer until all the water is absorbed. Remove from heat. 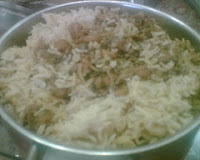 To prepare the topping, saute the onion in oil until golden. Add the spices, salt, chopped cilantro, grated lime-peel or loomi, and garlic/spice mixture, stirring to mix well. Add the remaining shrimp and saute until cooked through (about 4 minutes). Spoon shrimp/rice mixture onto a platter, arrange shrimp topping on top.